Only In Japan: Squealing bicycles. One favourite conversation topic among expats living in Japan is, you guessed it, Japan. Or to be more accurate, Japan bashing. Everything is fair game to relieve one's stress and frustrations: when will the Japanese ever learn English, and they must be really dumb to fork 10k Yen for a bleeding melon, and man can Japanese sararimen make fool of themselves when they're drunk, and if they're really such great engineers why can't they design bicycles that don't squeal like dying pigs when you brake, and so on, and so forth. You quickly learn to ignore this twaddle - it gets fairly repetitive - but there's one point where the foreigners get it 100% wrong: that bicycle brakes story. It is a fact that the blood-curdling squeal of a braking bicycle is one of the most common sounds to be heard in the streets of Japan, and it's not one you get used to. So how come Japanese engineers can design the world's best robots, phones and cars, but not simple bicycle brakes? And, Japan bashers add, you forget bicycle bells. Yes, they are also completely useless. I have never seen a Japanese bicycle bell work for more than a week after you buy a new bicycle. Actually, you NEVER hear one in Japan. So, you might ask, what do Japanese people do when they need to ask someone to clear the way? This is where the argument gets tricky: since you cannot use your bicycle bell, when you need to clear the way you just brake abruptly and you can be sure the resulting squeal will get the message loud and clear to everyone around. Sounds rude and completely inefficient? Think again. Because in Japan, bicycle brakes and bells are poorly designed on purpose. 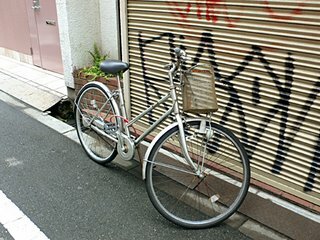 You see, ringing a bicycle bell makes Japanese people feel awkward, because it means "hey, you're in my way, move out!" and no self-respecting Japanese person would want to be so rude. Whereas if you are "forced to brake" at the last second because there are people in your way, and if said brakes unfortunately squeal very loud, well you didn't mean to be rude, so you don't need to feel awkward. And the people who were in your way get the message that they need to move, but they don't get the bad feeling that comes from clearly being told so by an annoyed bicycle ring. In other words, conflict was avoided, harmony was preserved, the group is at peace. Thanks to the engineers who designed "bad" brakes and bicycle rings.